Recently I had the opportunity to spend five weeks in the Denver, CO area working on a new "green-goldrush" business opportunity (don’t ask, don’t tell), and I was determined to make a series of first-time visits to the Blackhawk and Central City casino venues located 60 minutes away. I loosely planned to invest 40-60 hours in play during my five-week business trip. I first heard about Colorado’s "mining town" casinos in the early 90s when I was knee-deep in telecommunications-related syndication. 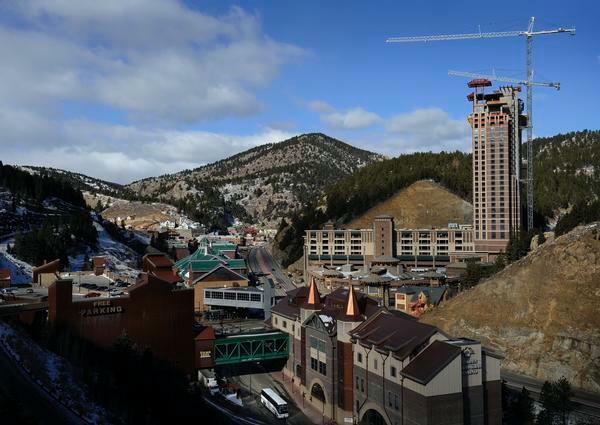 Colorado was, I think, the third state to legalize casino-banked games, a decade after New Jersey, and getting a jump on the rest of the nation. But the casinos soon to come (back then) were of little interest to me, other than the investment- raising side – private placement offerings were flying like crazy – but the novelty of Colorado gambling law in the 90s was to limit the maximum table games betting limit at $5.00. This is about as exciting as a box of California "safe and sane" fireworks. The Maloof brothers’ start in casino enterprise was this Blackhawk venue with $5.00 maximums. Then in 2008, the table game betting limits were raised to multiple hands of $100. My first trip to the Blackhawk casinos was with a new business associate, and soon-to-be blackjack protégé, "Salohcin." We rode in his BMW i8, which was luxurious, and the trip through the mountains was reminiscent of the hour drive to Lake Tahoe from Reno. The road skirted a whitewater river with occasional rafters shooting the rapids. I had given Salohcin (i.e., Sal) a single task prior to our visit: learn basic strategy (BS). It was an experiment actually; my old friend and memory science teacher Robin Clark of Mind Dynamics Institute had been developing a mnemonics-based technique for learning BS in a few hours rather than days or weeks and Salohcin was to be our guinea pig. And it worked! I was skeptical actually and wanted to test him in person but I had already heard he was "crushing it" on Dan Pronovost’s Blackjack Mentor iPhone app (deepnettech.com). We rendezvoused for coffee and I was impressed, he beat me 2 out of 3 contests on BS on the app. I decided to purchase the app too. Sal is a frequent poker player in Blackhawk and knew the casinos fairly well. There are two routes in and he had decided that we’d arrive via the adjacent smaller casino venue of Central City, which like Blackhawk proper, was an old gold mining town. Driving into Central City was like a time machine moment; the old buildings restored with casino gambling signs were very visible. If only the games were as old and good as the mining town atmosphere, I reflected. Our first stop was the newly opened Reserve casino that featured five six-deck tables with typical rules: h17, DAS, and RSA, about 78% penetration, and 0.55% house edge off the top for BS players. This was to be Sal’s first counting experience; we had spent breakfast going over some elementary hand signals that would allow him to be the "gorilla BP" while I signaled the bets and BS departures from first base. Sal got coffee while I settled in for 20 minutes playing a $5-25 pseudo progression and scored my first Colorado player’s card. Pretending not to know me, Sal pulled out his player’s card and $500. We would be spreading to a maximum bet of three (or four?) hands of $100. He arrived right as the shuffle commenced and I already made an important discovery: the house shuffle, a simple single-pass with no discard plugs, was ideal for "cut-offs tracking," the easiest form of shuffle tracking (and the only form I can actually do well). It turns out that only two of the tables are hand-shuffled, this being one. I was handed the cut card and proceeded to cut a count-rich 2.5 deck portion to the top of the pack and discreetly signaled my "secret" partner to bet our max off the top. The max bets continued for about two decks when the cut-offs portion ran out and I signaled him to take an imaginary cell call. I played out the shoe, ending with a moderately negative count. Sal returned and I whispered, "Let me cut," as he deferred the honor to me. This time my cut was determined to place the diluted cutoffs to the back, giving us about 3.5 decks of rich count. I signaled his initial bet at one hand of a hundred and soon he was betting our max three hands again. Our play continued like this for about two hours; him taking frequent cell calls and deferring the cut card to me. Up about $1,400, which was well above expectation, I gave the "end" signal and he colored up, copped a dinner café comp for two, and waited for me at the car. If Sal had been unsure of his interest in "scientific" BJ, this mostly lucky session cinched it. We drove five minutes to an off-property coffee shop for sandwiches, and next door I checked out a recreational cannabis shop and purchased a couple grams of top shelf Sativa and a pre-loaded pocket e-cig for which to imbue some additional flavor to this beautiful mountain-high BJ venue. Our next stop was Johnny-Z’s, a tacky dive-joint formerly owned by the Maloofs, and the only club in Colorado with a s17, DAS, two deck game; about a 0.20% house edge off the top. According to Wong’s CBJN, the penetration was a poor 50% dealt from a shoe, but worth a peek in these parts. Sal would watch this time. The game was doubly tough, owing not only to the shallow penetration but also the no mid-entry preventing me from going from one to multiple hands between shuffles while being capped at $100. I bet off the top three hands of $30 and switched it up to $50 per two hands with any modest count and two hands of $100 in any moderate or higher count. When the count would tank, I would go to two hands at $25, and below that I would mostly try for the old cell-call interruption. The cell-phone-call-out-ploy wasn’t always working to plan, however, playing heads-up, the dealer was instructed to wait for players in general. On a few occasions I was able to strike the three-times $100 max bet, but most of my max bets were only two handed. On the good side, two of our three dealers were playing out closer to 60% of the pack, making it a bit more comfortable to extend the three hands of $30 bets and doing a semi-play/all approach with a minimum of two hand $25’s. We ended the session after about 75 minutes and felt lucky to be up another $800 given the poor net-effective betting spread, Sal was beside himself and stopped me on the street excitedly, "Were you counting?!" I had been playing fairly fast, easily hitting 300+ hands per hour heads-up, and this was the first time he had seen anything like that. We headed another five minutes up the road to Blackhawk proper, and the venue was noticeably livelier than the Central City area with 11 clubs of merit. We parked near the nexus of clubs comprising the Lodge, Ameristar, Golden Gates and Mardi Gras. Three of the four have two-deck games worth checking out and the fourth, Ameristar, looming high above the rest, has the best six-deck game according to Wong’s CBJN, with 85% penetration and the same h17, DAS, RSA rules. Our first play in Blackhawk proper was at Golden Gates, a divey and noisy place with two double-deck pitch games. Sal went to enter his poker tourney and I scoped out the BJ for a few minutes – these double deckers were no mid entry BUT spreading to multiple hands IS allowed, and the notched shuffle card appeared to be just shy of 60%. One of the two seated players walked as I reached for some buy in. I jumped in after the shuffle with three hands of $25, the count rose marginally and I switched up to two hands of $50; another uptick occurred, and I went to one hand of $100. I lost the $100 as the count spiked so I threw out three hands of $100, winning two of the three and bet the three-times $100 again. This round was a monster with two doubles and a pair of tens that I split once as the shuffle card came out. Winning all three doubled bets I was faced with a conundrum: the dealer was shuffling, should I reduce my bet? Nope. I decided to bet the three max off the top, won one of the three and let it go again solo at $100, despite the tanked count, and won and bet it again for another win as the count dropped further south. Faced with my payoff, I reached for an imaginary cell call and remained seated. The pit critter in attendance told me I had to step away and I complied, staying on the call until the shuffle, at which point they asked me if I had a player’s card and I produced my ID. Now I had an interesting pattern devised on the fly; a quasi-grifter gambit with a canonical twist – betting three hands of $25-30 in moderately minus counts, consolidating to two times $50 in modest plus counts, and then one hand of $100 in moderate plus territory … and then spreading out again to two and three hands of $100 as the count dictated, while avoiding the worst counts with "phony" cell calls. Each time I grabbed my phone, I feigned oblivious to the need to step away until reminded by the dealer or boss. Along the way, I checked for possible hole-card flashing but the house dealing method was a new technique that had the dealer sliding her second card off the back of the pack flat unto the surface, so no go. I also tried key-carding aces despite the shuffle machine, but after a limited sampling, I was seeing no correlation so I gave it up quickly. After about an hour and another semi-lucky win of $600, three for three so far, I colored up and got a couple of buffet comps. Sal was settled in on his poker tourney and I stepped out to the smoking lounge (no smoking in Colorado casinos) and took a couple of discreet puffs on my cannabis e-cig. So far, despite the limited and mediocre games, I was grooving with this new "virgin" venue. My single fear, borne of the small similar Tahoe venue in a previous era, was that maybe if I got barred in one club, they might flyer the entire list. Maybe I should try to be careful? and his second and third visits there, where Sal starts counting for real. I see you are still the Master Of The Game Very entertaining and I take it you are long gone from that area, thus your narrative about the conquest. Had I been there I would have played nothing but the STing game, and your chance of being flyered would have been greatly reduced, and the EV off the chart. Congrats, I am happy for you. Blackhawk, with Ameristar rising four years ago. I tried to teach a friend of mine basic strategy and he failed with flying colors. He had weeks to prepare himself before this casino trip and I quizzed him as we were in en route. I was disappointed because the first 5 questions I asked him he got wrong. It probably doesn't help that his eye sight is a crutch to him but there are no excuses when the money hits the felt. On this trip I took my buddy and his girlfriend. I was the only winner on this trip and gambled on the NLHE table until the sun came up the next morning leaving a big winner, I got several wins on different BJ tables but scored much better on the poker table by the virtue of patience. Last edited by Blitzkrieg; December 30th, 2014 at 02:03 PM. Great report! I see Colorado now has everything you need ZG! Well, it did have, until he spilled the beans. Last edited by zengrifter; August 23rd, 2016 at 12:11 PM. Thanks for the report ZG......hopefully I can visit the place this winter. It's been a year since I was there . That's a cozy looking shop. So was the cannabis e-cig able to live up to it's hype and give you a good buzz compared to medical buds? Let's hook up next time, so I can report to the unwashed masses how REAL PROS do it! I'm game! I love that place! Does anyone have any questions about what I was doing in the first three sessions and/or the efficacy of my approach(s)? [1 ] What was your expectation? All 3 sessions you seem to have been 'lucky'. Please give us more on this 'luck' factor.